Anneke continues our mustard theme with a gorgeous fresh and funky wrapped journal. She shows a brilliant technique to make a one layer journal seem multi layered and the way she continues the vibrancy onto the inside cover is the perfect finish. 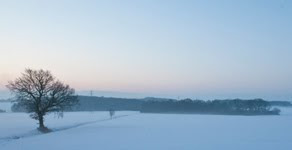 Stockist info for 2019 products is available here. Hi everyone, it's Anneke with you today, and I'd like to share with you a wrapped mixed media journal I made. 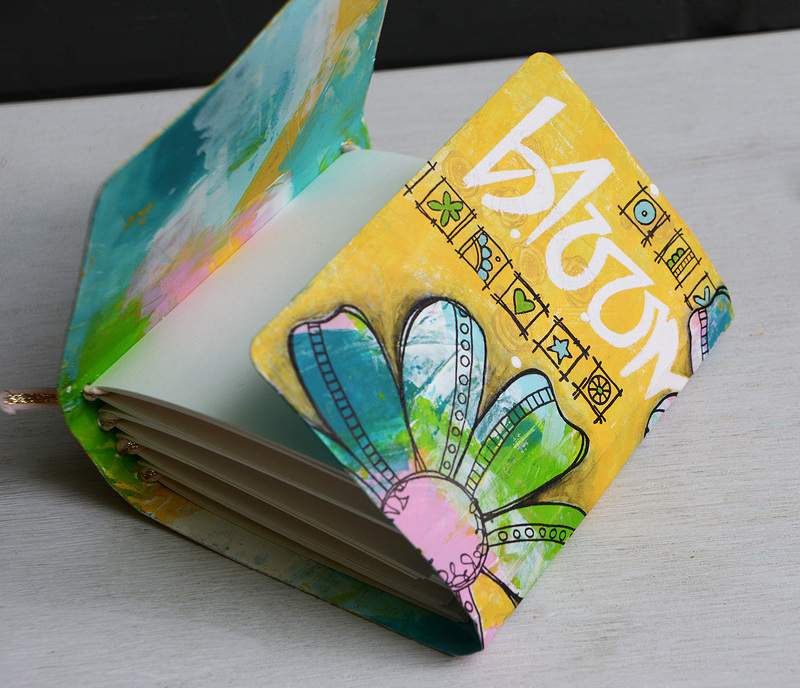 As you know I love making my own art journals. I make them as big or as small as I wish and what is more important: I fill them with my favorite papers. For this color challenge I combined the beautiful Fresco Finish Mustard Pickle with various shades of blue, green and pink to create a one layer cover. 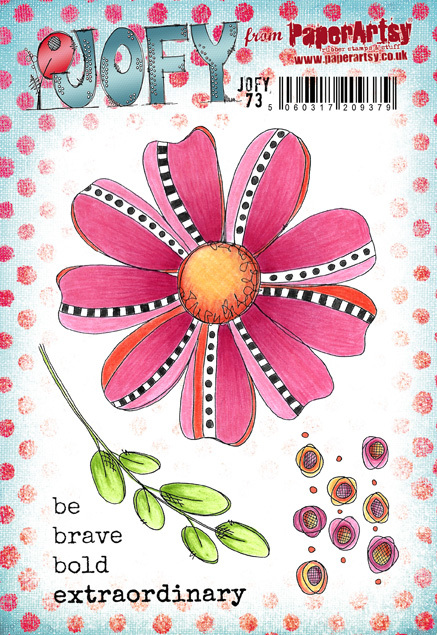 To decorate the cover I worked with stamps from the new JOFY 72 and JOFY 73 stamp sets. This is how the finished journal looks like when it's closed. 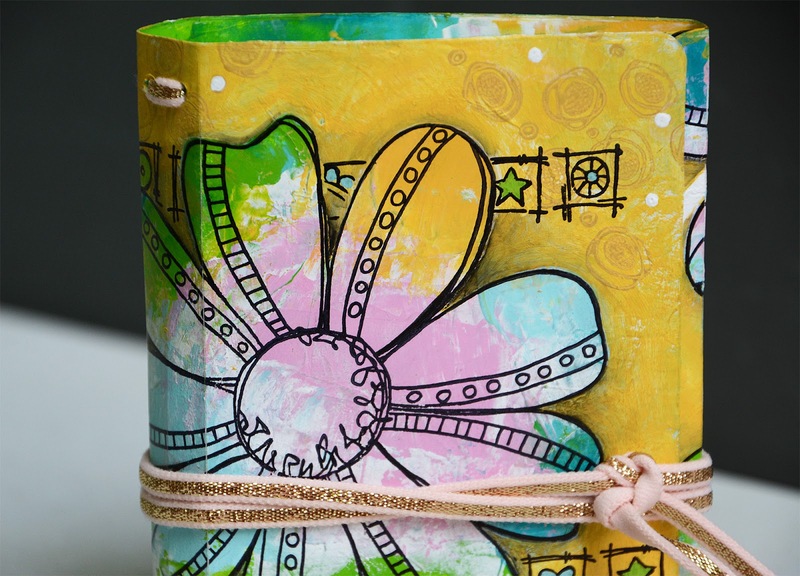 To cut the cover I used the Sizzix "Wrapped Journal" die by Eileen Hull. After running the die plus a strip of watercolor paper through my die cutting machine I ended up with a ready made cover, fold marks and holes included. A very quick way to cut a versatile cover without measuring. 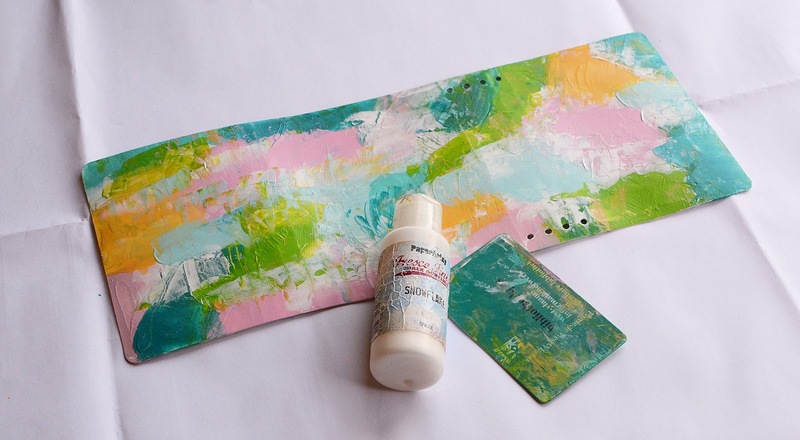 I started by applying paint to the cover with a plastic card. I used Fresco Finish Chalk Acrylics Mermaid, Caribbean Sea, Beach Hut, Candy Floss, Blah Mange and Mustard Pickle. I added some lime Amsterdam acrylic paint as well. Before the paint was totally dry, I toned down the colors by applying Fresco Finish chalk acrylic in the colour Snowflake randomly. 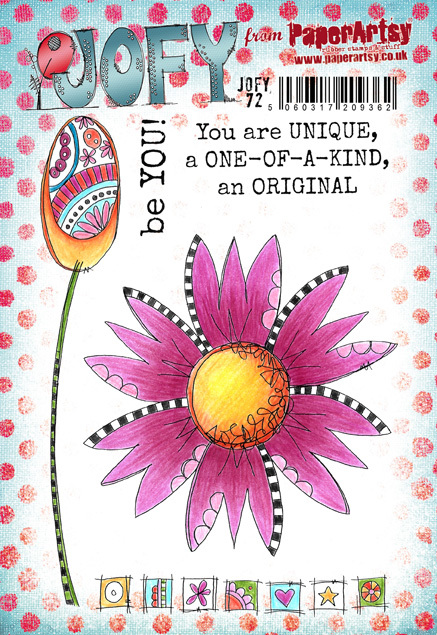 I stamped the beautiful flower from the JOFY 73 set 3 times on the painted background using Archival Ink Jet Black. 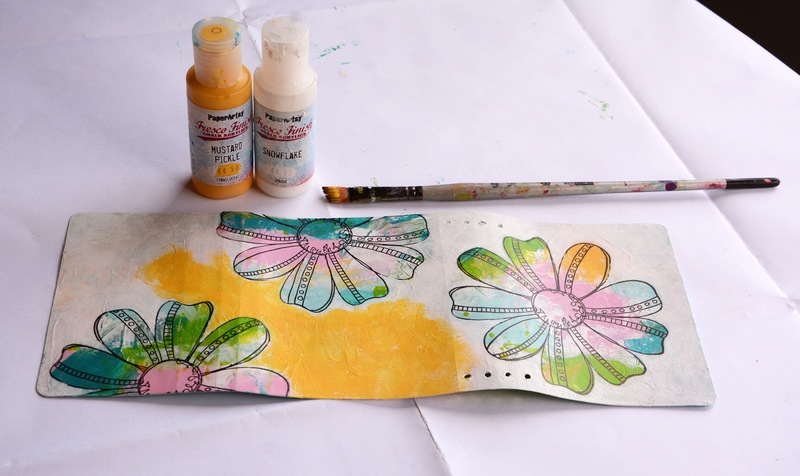 Next I painted the areas around the flowers with one layer of Fresco Finish Snowflake. After drying I added a layer of Mustard Pickle. Because the Mustard Pickle is a translucent paint, parts of the white paint show through randomly, and that's what I like. I've painted the inside cover as well. For the inserts I've cut 20 papers out of mixed media paper (size 11 x 19,5 cm). I folded each paper in half and nested 5 papers into each other to make 4 signatures. The binding can be done in different ways. I used elastic band that I've 'woven' through the holes. I ended up with 4 strips of elastic band on the inside to hold the inserts in place. This is how the binding looks like along the spine. I'm very fond of this type of binding because the signatures can be removed temporarily to work in. 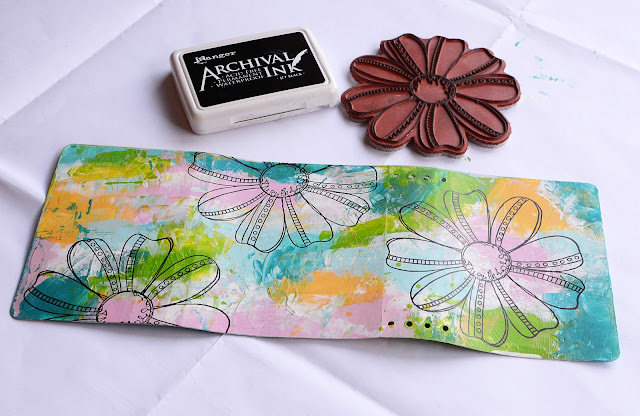 I covered the flowers with a mask before adding some stamping on the background. I stamped circles from the JOFY 73 set with Fresco Finish Haystack and squares from the JOFY 72 set with Archival Ink Jet Black. 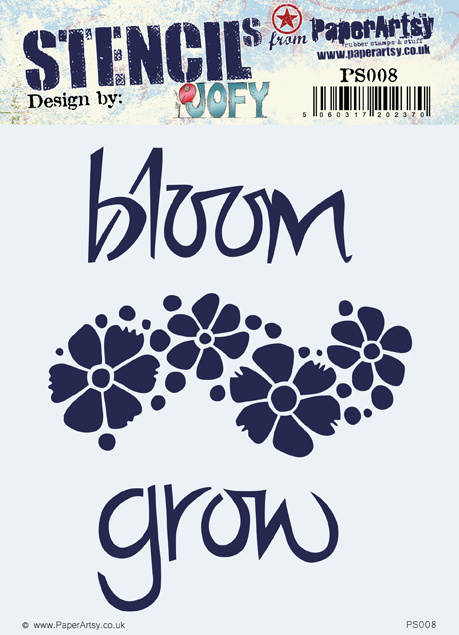 I 'wrote' the word 'bloom' by sponging through the JOFY PS008 stencil using Fresco Finish Snowflake. I added shadow to the flowers with a black Stabilo pen. When closed the journal measures approx. 13 x 11cm. Even on this rather small cover the XL JOFY flowers look nice, don't they? I've chosen to work with a one layer technique on the cover. I've experienced how a one layer cover remains undamaged no matter how often I pick the journal up or how often I threw it in my handbag or suitcase. All the layers of paint make the cover very sturdy and nothing is glued on so nothing can fall apart. Mustard Pickle is not a color I would automatically pick to create a project. For this challenge I had to and I'm happy I did! 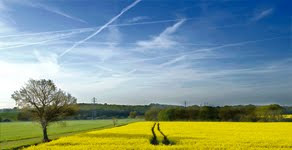 It's a beautiful color that matches well with the bright colors of the flowers. I hope I could inspire you to make a project with Courtney's beautiful Mustard Pickle paint. I would love to see what you come up with! 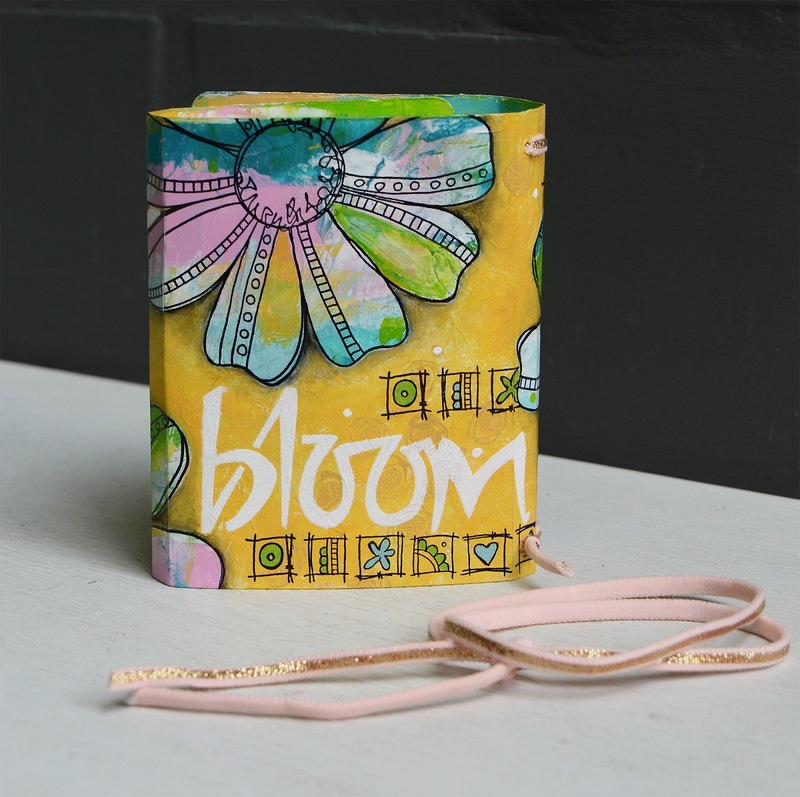 This is a stunning journal Anneke. What a fab journal Anneke, just love that cover! Ohh I love this. 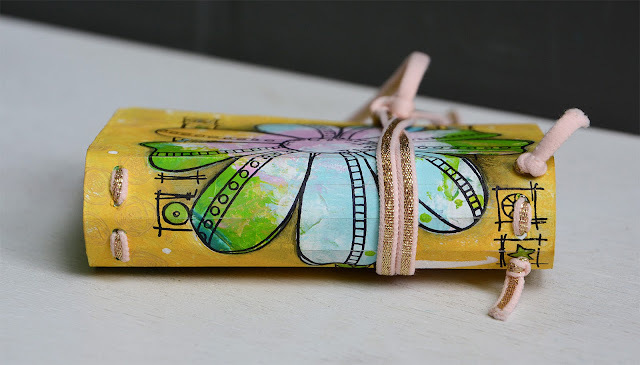 Some of the Eileen Hull gang used this in a blog hop with us, Emerald Creek and Seth last year and it is such a fun die! I love how you have left it as a curvy little number!! 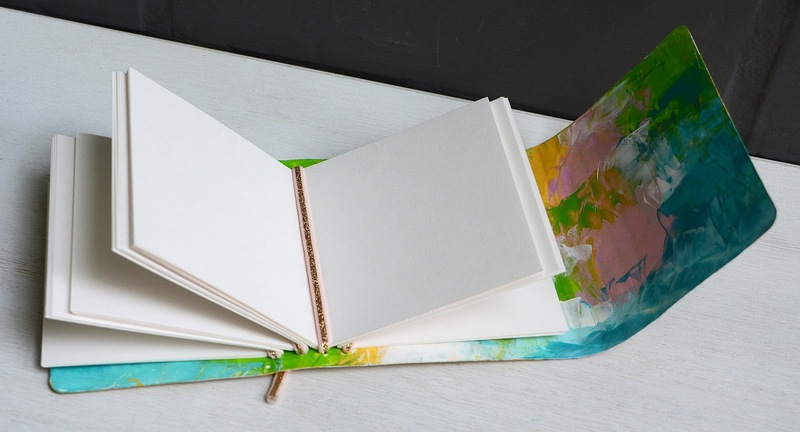 It looks so user-friendly with the elasticated binding too! Great project!!! 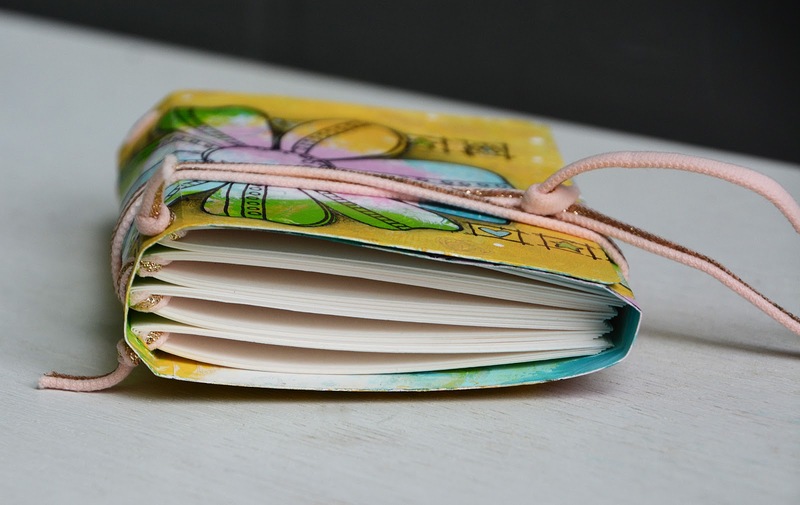 Mustard wouldn't be me my go to colour either but it works well in this colour scheme and the one layer cover is perfect for a journal! 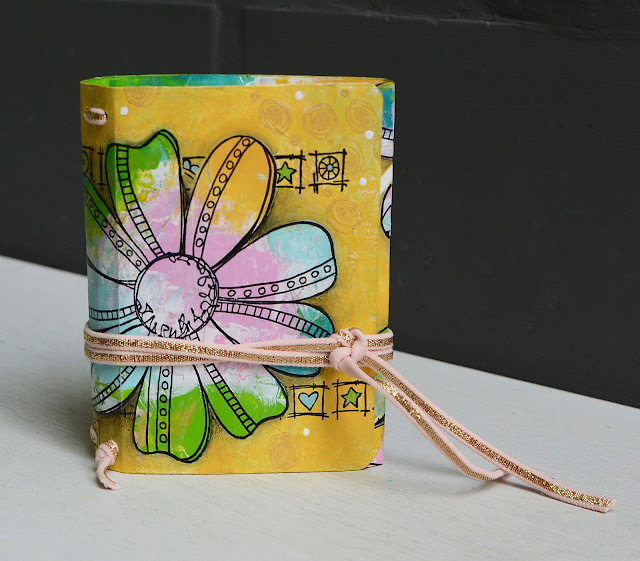 I love the bright and breezy feel of this... a great version of the wrapped journal, Anneke. 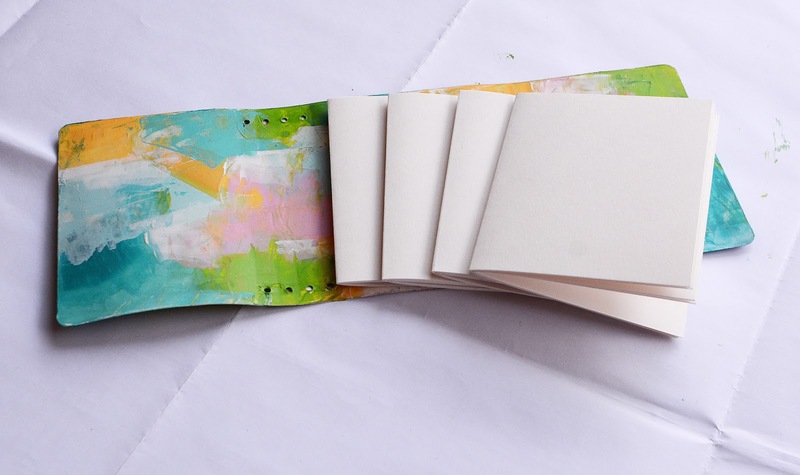 I never ever tire of these journals as substrates and am crazy over your amazing color combo and layering here! 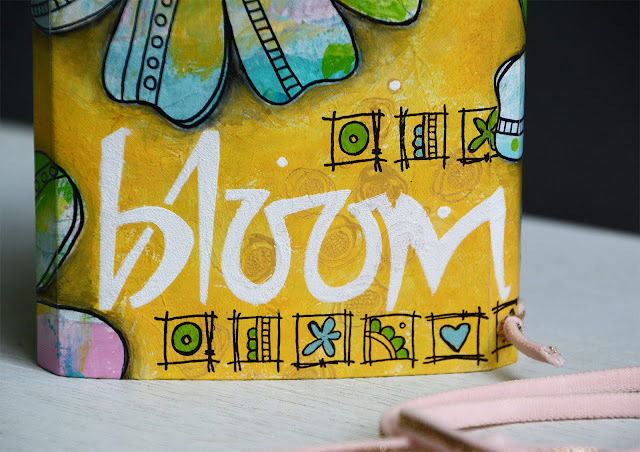 This is such an amazing journal Anneke! 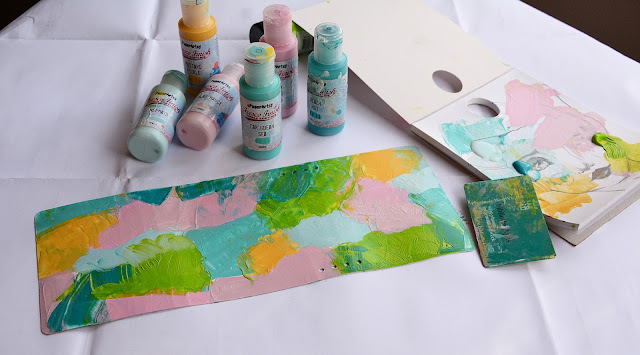 Fresco - Basic How To. Jan 26-29, 2019 Creativeworld , Frankfurt, Germany. Demos on the stand. Feb 17-19, 2019 CHSI Stitches , Birmingham, UK. PaperArtsy dedicated classroom for the full 3 days of the show, with all designers teaching classes and make and takes daily with their new products. Demos on the stand. Visit PaperArtsy's profile on Pinterest.